I used to subscribe to G-Fan awhile ago, but stopped just because there came to be less and less stuff I was interested in within the pages (kids section, stuff about american monster films). Just curious how it's been lately. It was always cool when they had interviews with Japanese actors and such. I went to their site and saw the last interview had an interview with the one and only Kumi Mizuno O_O Anything good in there? I got the last couple issues at a comic store a couple weeks ago and found them extremely sub-par... even the much touted "100th Issue"- The Mizuno interview was a fun read, but its the same stuff you read in every Mizuno interview. The best part was hearing how much fun she had shooting Final Wars, since I'm not sure I've seen any interview with her from after 2002 or so. Other than that though, yeah, the same stories about Nick Adams, Ishiro Honda, Russ Tamblyn, etc. that we've all heard. Just get Monster Attack Team instead. Isn't the latest issue of MAT about 2 years old at this point? klen7 wrote: Isn't the latest issue of MAT about 2 years old at this point? Yeah, but MAT got bought out by Famous Monsters and has a new issue coming very soon. I think its still only going to be once or twice a year, but so far every issue of MAT has been better than the last 15 years of G-Fan. Just like how Japanese Giants was always better, even though it only came out every few years. Quality > Quantity. G-Fan hasn't honestly been interesting in a loooooooong time, which is why I stopped subscribing around 2004 or so. Most of the articles are recycled information and since around 2001 or so, their articles have been much more simple (maybe to accommodate younger readers). I feel like stuff like MAT and Japanese Giants and Japanese Fantasy Film Journal, etc. are more geared towards older readers who are more into the academic side of the genre. I still follow G-Fan (since 2002ish) and while it does have its occasional slumps, I enjoy it. Granted I have never read a Kumi Mizuno interview (I sang its praises in some thread around here) so maybe I am a more casual fan. Other than the spectacular Eggleton cover, I didn't get much from the latest kaiju based Famous Monsters, and I would only recommend the last 2 or 3 of MAT. I'll be keeping an eye out for more, but a year or 3 between issues of a fanzine makes it hard to recommend. Especially when the MAT site sells the latest issue for $28. Worth picking up from a con when they have their booth for much cheaper, but a little too much to justify tracking it down. Well now that MAT is in wide distribution and has an actual company backing it, I doubt those issues will persist. J.D. I think has the right intentions even if the information isn't as informative as we would like ti to be. I just wonder about the future of the magazine with so many things going digital. He says he has enough material to go on for a while, but the recent lapses (also issue #101 is supposed to be available to subscribers only since #102 will be coming out before it??) cause me to wonder if the financial cost of creating the magazine are becoming tooexcessive, or if he just dosen't have enough time to devote to putting together the magazine anymore. MouthForWar wrote: Well now that MAT is in wide distribution and has an actual company backing it, I doubt those issues will persist. That's good news, when is the next issue supposed to be coming out? Apparently its shipping in May. It will be semi-annual, so it will be coming out twice a year. I'll take two MAT issues a year over 4 sub par G-Fan issues per year. Most of the people that stopped working with G-Fan (most of their better writers at that) are writing for MAT now anyway. Last edited by MouthForWar on Wed Apr 24, 2013 10:49 am, edited 1 time in total. Cool. I hope my local shop gets it when it coems out. At $20 an issue i hope it is as good as 3 or 4 G-Fans. klen7 wrote: At $20 an issue i hope it is as good as 3 or 4 G-Fans. expecting 200+ pages of content. Is it out? (issue #106) ? I wait until the end of the month so I can try to get it, but my local shop didn't have it yet. O.Supreme wrote: I just wonder about the future of the magazine with so many things going digital. He says he has enough material to go on for a while, but the recent lapses (also issue #101 is supposed to be available to subscribers only since #102 will be coming out before it??) cause me to wonder if the financial cost of creating the magazine are becoming tooexcessive, or if he just dosen't have enough time to devote to putting together the magazine anymore. I stopped buying G-Fan for a very long time, and also comics for that matter until they started going digital. I find myself doing so much more reading on my phone or iPad than I ever before. I think it would be awesome if G-Fan also went digital, although I have no idea how much it would cost to publish digital Vs printed, I would guess that going digital would cut the cost of print and would have a wider appeal on Kindle, Google Books or iBooks. If that ever happened I would gladly give G-Fan another look. O.Supreme wrote: Is it out? (issue #106) ? I wait until the end of the month so I can try to get it, but my local shop didn't have it yet. I received mine two weeks ago. Why not get it online? G-Fan.com doesn't have any option to purchase an online version that I am aware of. So... 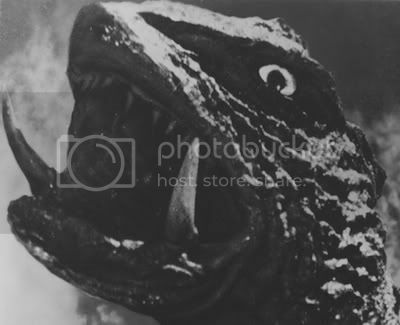 I read the latest issue, what intrigued me was an article about an "unaired" mst3K episode (Godzilla vs Mechagodzilla) which supposedly never aired because Toho's Legal Dept. stopped it. vs Mechagodzilla? What a peculiar entry. I can see vs Megalon, sure. Hell, I am surprised vs Gigan didn't make it either. But vs Sea Monster, and in this case vs Mechagodzilla sure is a weird entry. I'd love to see this some time. O.Supreme wrote: So... I read the latest issue, what intrigued me was an article about an "unaired" mst3K episode (Godzilla vs Mechagodzilla) which supposedly never aired because Toho's Legal Dept. stopped it. As a Godzilla fan and a MSTie, I've never heard this. That said, I have yet to see the article (forgot to renew, wholly my fault). It may help to locate a list for each year after 1984 of public domain releases. I don't know what year Cinema Shares Distribution folded but if you go 7 years after that date and google public domain titles you might get "Godzilla vs. The Cosmic Monster". If that's the case it is possible it was considered for the program. It was a stupid April Fool's joke and the author only mentioned this fact at the very end of the article. It would've been a more believable lie to say that the folks behind MST3K thought they could secure the rights to the movie only to find out they couldn't before they went into actual production. That happened to them a few times, with Frank opining about how much he wanted to do the Elvis Presley western Charro!.